THE LINK BETWEEN CLIMATE CHANGE AND ISIS IS REAL | "Global Possibilities"
Democratic presidential candidate Martin O’Malley linked climate change to the rise of ISIS earlier this week. Conservatives pounced. Score this round for O’Malley. For three years now, leading security and climate experts — and Syrians themselves — have made the connection between climate change and the Syrian civil war. Indeed, when a major peer-reviewed study came out on in March making this very case, Retired Navy Rear Admiral David Titley said it identifies “a pretty convincing climate fingerprint” for the Syrian drought. Let’s run through the science underpinning what O’Malley, Admiral Titley, and others have said. We know that the Syrian civil war that helped drive the rise of the terrorist Islamic State of Iraq and Greater Syria (ISIS) was itself spawned in large part by what one expert called perhaps “the worst long-term drought and most severe set of crop failures since agricultural civilizations began in the Fertile Crescent,” from 2006 to 2010. The study identifies “a pretty convincing climate fingerprint” for the Syrian drought, Admiral Titley told Slate at the time. Titley is the former COO of NOAA. This study and others make clear that for large parts of the not-terribly-stable region around Syria — including Lebanon, Israel, Jordan, and parts of Turkey and Iraq — brutal multi-year droughts are poised to become the norm in the coming decades if we don’t reverse carbon pollution trends ASAP. Reds and oranges highlight lands around the Mediterranean that experienced significantly drier winters during 1971-2010 than the comparison period of 1902-2010. Via NOAA [Click to enlarge]. The connection between the conflict in Syria and climate change is not new. 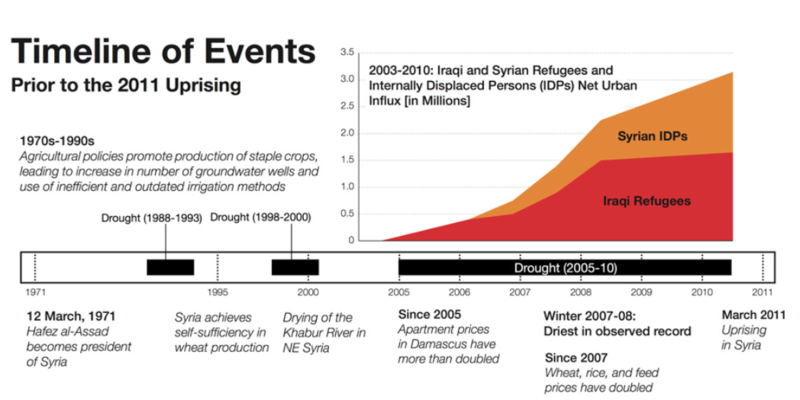 In March 2012, Climate Progress published a piece by Francesco Femia and Caitlin Werrell, co-founders and directors of the Center for Climate and Security, which made the case for the link between climate change and events in Syria. In 2013, Tom Friedman went to Syria to learn firsthand about the connection between the drought and the civil war. His New York Times column, “Without Water, Revolution,” explains what he discovered. Friedman also filmed his visit, where he talked to actual Syrians about the causes of the civil war. It was for the premiere episode in April 2014 of the Emmy-winning Showtime series, “Years of Living Dangerously,” which can be viewed on Netflix right here. Many other recent studies have been done on this subject, such as “Water, Drought, Climate Change, and Conflict in Syria” by climate and water expert Peter Gleick. Palmer Drought Severity Index (PDSI) for 2080-2099 with business-as-usual warming. By comparison, during the 1930s Dust Bowl, the PDSI in the Great Plains rarely exceeded -3 (see here). Source: Cook et al. and Climate Progress. The bottom line: Homo sapiens is currently on track to make drought and extreme drying the normal condition for the Southwest, Central Plains, the Amazon, southern Europe, the entire region around the Mediterranean, and many other key areas post-2050. Returning to O’Malley’s comments, it’s pretty clear that they are quite reasonable and defensible. Personally, because the causes of war and terrorism are so complicated and interconnected, I prefer to say things like “climate change HELPED create conditions for rise of ISIS.” Not that nuanced phrasing will not spare anyone the attacks from the anti-science crowd.